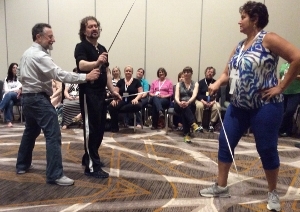 Kathy Lynn Emerson (aka Kaitlyn Dunnett) here, to share some of what I learned in the three-hour Rapier/Dagger/Smallsword Workshop at the Historical Novel Society’s North American Conference in Denver last month. 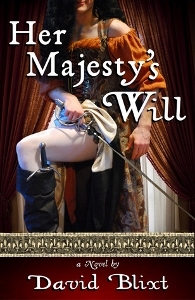 This opportunity came at an extremely good time for me, as I’m about to start writing the third book in my series featuring Mistress Rosamond Jaffrey, Elizabethan sleuth and sometime spy. When I developed the character, in Murder in the Queen’s Wardrobe, I gave her two knives to carry for protection, one sheathed in her boot and the other hidden in a special pocket inside her cloak. Beyond establishing that she knows how to use them, both for stabbing and for throwing, I haven’t had her do much with them in the first two books in the series. 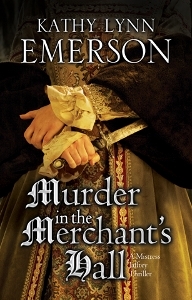 The dagger pictured on the cover of the second entry, Murder in the Merchant’s Hall (December 2015), is too large to be one of Rosamond’s concealed weapons, but compared to the daggers used in what is called “rapier and dagger fighting,” it’s not that big, either. This was the style of fighting taught to men in the sixteenth century. I’d read quite a bit about it, but until the workshop I’d never had the chance to see it demonstrated up close and personal, let alone an opportunity to actually handle the blades and practice some of the footwork and wrist movements involved. 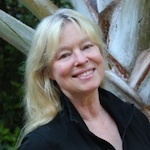 Several of the points made by instructor David Blixt seem likely to apply to the situations Rosamond will encounter in the next novel, even though she will probably not engage in two handed fighting herself. What follows are some examples of advice I hope she’ll take to heart. *Using a blade requires constant training and drills to create muscle memory and dancing is one of the ways men train for fighting with rapier and dagger. *Force your opponent’s body to bend in the direction it wants to go to throw him off balance. *Adrenalin is not your friend. You have to keep thinking and be measured and calm. *Making noise, such as shouting or swearing, while you fight is to remind yourself to breathe. Holding your breath will get you killed. *Hit with the forearm, not the hand. The hand has too many bones. *Gloves protect the hands and can knock away a blade. *Fights are usually very short. *Left-handed people either learned to fight right-handed or fought left-handed and were mocked. But the left-handed fighter had the advantage of being able to make unexpected moves. *The dagger (in the off hand) defends and the rapier attacks, but it is possible to seize an opportunity and attack with the dagger. *In fighting, use joints rather than muscles because muscles tire. The illustrations above were taken during the workshop. Since I was the one taking them, I’m not in any of them. Probably just as well. Arthritic fingers and ankles do not lend themselves to the necessary moves, although I was able to do enough to get a feel for the process. I also used my iPad to shoot brief videos of parts of the demonstration. I expect these clips will be very useful if Rosamond’s husband Rob, or any other male characters, end up fighting with rapier and dagger in Book Three. Rosamond may even toy with the idea of taking lessons in sword fighting herself and ask Rob to teach her, although I expect she’ll decide to stick to smaller blades. There will definitely be a scene in which she is practicing throwing her knives at a target. I can’t close without saying a few more words about David Blixt. In addition to being a gifted teacher, he is also a stage actor and a writer. Although I generally avoid reading other people’s fiction when it is set in the sixteenth century, I couldn’t resist buying his Elizabethan novel, Her Majesty’s Will. Picture Shakespeare and Marlowe, before they became playwrights, as two very inept spies. 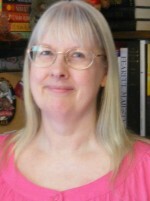 Kathy Lynn Emerson/Kaitlyn Dunnett is the author of over fifty books written under several names. 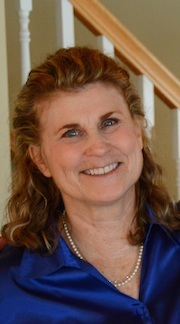 She won the Agatha Award in 2008 for best mystery nonfiction for How to Write Killer Historical Mysteries and was an Agatha Award finalist in 2014 in the best mystery short story category for “The Blessing Witch.” Currently she writes the contemporary Liss MacCrimmon Mysteries (Ho-Ho-Homicide, 2014) as Kaitlyn and the historical Mistress Jaffrey Mysteries as Kathy (Murder in the Queen’s Wardrobe, 2015). The latter series is a spin-off from the Face Down series and is set in Elizabethan England. 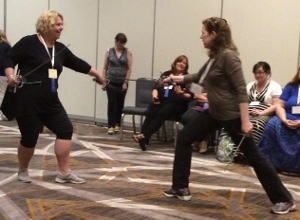 This entry was posted in Kaitlyn's Posts and tagged David Blixt, Denver, Historical Novel Society North American Conference, Kaitlyn Dunnett, Kathy Lynn Emerson, Mistress Jaffrey Mysteries, Murder in the Merchant's Hall, rapier/dagger/smallsword workshop. Bookmark the permalink. This is fascinating, Kathy. I love the part about dance as training, and also hitting with the forearm rather than the hand. Very cool info! Thanks, Brenda. It was one of the best sessions I’ve ever attended at a conference. Never have three hours gone by so fast! This is so interesting, Kathy! When I attended the Fairfax County Citizens Police Academy I was fascinated when one of the officers said very few full out fights last longer than a minute and a half. I love the comment about the forearm and yelling during the fight! Thanks for sharing your experience! Fortunately, they did the demonstrations in slow motion! P.S. I’m reading The Longest Yard Sale now and enjoying it tremendously. Great post, lots of good information. In college I had a class in stage fighting, which is far different than real combat. 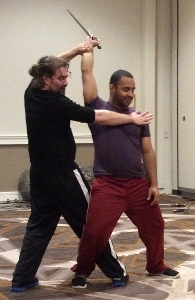 Swordplay on stage is just flash and noise but not intended to actually hurt the other actor. But in your case you want your protagonist to protect herself! The instructor for the workshop told lots of gory stories about accidents during onstage fight scenes. As an aside, he mentioned that real-life knife fights scare him to death. There’s apparently a book on the subject written by those who know the “art” best. . . incarcerated felons! Wow. Sounds like a whole lot of fun. As we know, research can give powerful insight into our character’s situation and our story. I hide in the tick-infested woods, you get to sword fight. Perhaps I’m doing the wrong kind of writing?